TMEIC in Roanoke County signed the largest one-time contract order for automated stacking cranes at the Port of Virginia on Friday. The $217 million contract with Konecranes was announced late last year and includes 86 specialized cranes that will be at the center of the port’s expansion projects. Roanoke-based TMEIC is Konecranes’ automation technology partner, meaning the automation for these cranes will be supplied by TMEIC. 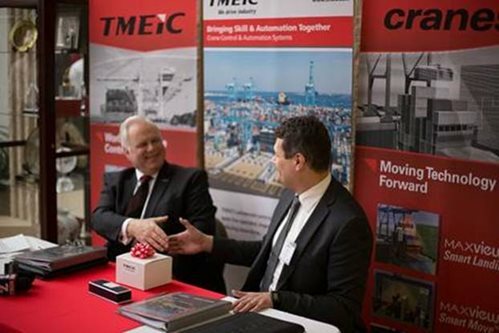 In addition to supplying 860 TMEIC-manufactured TMdrive-10e2 industrial drives, the automation package for the project will incorporate TMEIC’s state of the art laser-based Maxview and Maxspeed control systems, providing automated solutions for high speed movement and placement of both 20 and 40 foot containers. Maxspeed crane control systems constantly adjust speed and direction of the crane motors driving the gantry, trolley, cable reels and hoist, providing incredibly fast reaction time to operator joystick, precise control and ultimately higher crane production rates. In conjunction with TMEIC’s Maxview crane laser-based vision systems, The Port of Virginia expansion will experience labor savings, increased yard productivity, reduced equipment maintenance and improved safety. Because of the expansion project, the port will expand container handling capacity at of Virginia International Gateway by 600,000 units and the capacity at Norfolk International Terminal by 400,000 units by 2020.